This post is step 1 in our Investing Template. Deciding when and how to pay off your debts is not a simple matter. While it can be comforting to be debt-free, that may not always be the most financially expedient approach-nor is it the whole picture. Here are a few steps, including analyzing and paying off debt, that really make your money work FOR you. The absolute first thing you need to have is something to pay for unforeseen events. I personally recommend keeping this fund as small as possible at the beginning. We’ll get to creating a larger cushion later, but right now the goal is simply to get enough money so that you’re covered if your car breaks down or something else untoward happens. In fact, in some cases I’d recommend skipping this step altogether. If you have friends or family you believe you can reliably rely on in case of an emergency, get right down to paying off any debts. Once your debts are paid off, go on to creating an expanded emergency fund. You cannot possibly hope to match the interest rate you will be charged with late fees and penalties, so you have to pay at least the minimum to every debt you have. So no matter what other options are open to you, do not let yourself be subjected to these kinds of charges. If you cannot meet your minimum payments, it’s time for another job, or to sell some things. Getting your head above water is a separate subject, but make sure to do it. Now despite the allure of being debt-free, there are some rare occasions that your bottom line will be better served by contributing to your tax-deferred savings. Quite simply, if your company matches your tax-deferred account at 50% or better, you may be better off contributing to that account. This is of course only true up to the amount that they match. Do not contribute more than they match until your debts are all paid off. For example, if my company will match up to 3% of my salary in my 401(k) at 100%, I am possibly better off making this contribution instead of paying off my debts. I will make 100% return on that money put into my 401(k), while I will probably be charged 20% on the debts I leave unpaid. Generally speaking however, unless your debt is relatively small compared to your income, or you are very secure that your income will continue, you are probably still better off just paying the debt. There is no sense investing in anything when you have the option of paying off your debts. The only debt you may want to carry is a house or a car, and even those are questionable. Even beyond the dangers of high-interest debt, it simply provides a security blanket to have your debt cleared. There are various approaches to paying off your debt, but get it done before you start investing your money elsewhere. Moreover, when in doubt: pay off your debts sooner than later. I have spent the last 2 years positioning myself to the point I am now where I’m completely debt free except for my mortgage. It is such an incredible feeling to have absolutely nothing hanging over my shoulder. It’s awesome to be able to make double payments against my mortgage. There is such a freedom about it. I would also add that, in expansion to step 1, that you should resolve to never ever use debt again. 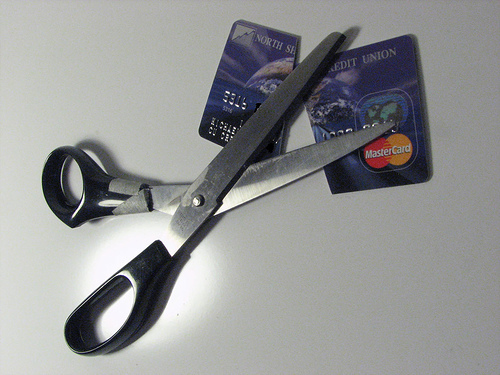 Cut up your credit cards like it shows in the picture so that you can’t use it even if you wanted to. Don’t let yourself even be tempted to use debt. If you have an overdraft plan into a HELOC, cancel it. I know that seems counter-intuitive but it will train you not to overdraft your account.